Carmen Chai, a health reporter at Global News, has covered global health-care issues from outbreaks of Ebola and Zika virus to providing in-depth looks at anti-vaccination movements and chronic diseases like obesity and Alzheimer’s. In the Tortured Mind series, Carmen looks at how a lack of mental health literacy is hurting Canadian adolescents and considers how education should be rolled out. Before joining Global, Carmen reported for Postmedia News’ wire service in Ottawa, the Toronto Star, National Post and the Vancouver Province. 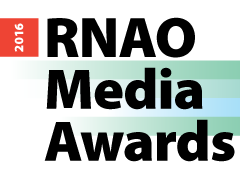 This is Carmen’s third RNAO Media Award. Andrew Russell is a national online journalist with Global News. He got his start in journalism in 2013 after completing degrees at the University of Toronto and Humber College’s graduate journalism program. He’s tackled stories on politics, problems in the prison system, issues around accessing mental health care and breaking news. He enjoys long-form storytelling and digging deep into issues that affect Canadians from all walks of life. Andrew joined Global’s investigative unit in January 2017 and is currently based in Toronto, where he also volunteers with the Lions Foundation of Canada Dog Guides.